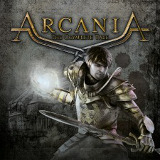 Arcania aka Arcania Gothic 4 was originally released on last gen consoles and PCs back in 2010 and a year later on PS3 with an expansion attached. Now released on next gen with said expansion, does it have improved visuals and game play that most of these re-makes promise? Short answer, no! In a time where definitive/remaster/ultimate editions are the fad in the early days of the next gen life cycle, this shouldn’t be considered to fall into that category. Graphically it has got the whole budget look to it; character models are average and lip syncing is woeful almost as bad as the actors’ voice work itself. It’s a shame as the setting is probably the best looking thing in the game. That’s not to say Spellbound Entertainment are trying to package the game as an upgrade on the last gen version it just seems to be a straight port. But lets not be too negative. When swaggers asked me if I could review the game in some ways I was more excited to do so than with the previous 2 games I had reviewed. Both of those were game genres I had played previously or had an interest in. Arcania is not and although it wasn’t something I would normally buy and/or play I was pleasantly surprised when I started it. The game is very user friendly when it comes to teaching you what you can do, weapon uses, skill assignment, general combat and more. Being a total novice to this genre I was quickly up to speed with the games mechanics and felt comfortable on the journey ahead. Starting up you play an un-named hero, initially in a peaceful village with much to look forward to. Tragedy strikes and the hero’s quest soon becomes one of revenge and self discovery. Going back to the acting the performance wasn’t enough to make me invest in the character but the story in general was quite interesting and I was soon doing various tasks leading toward the eventual goal. It was refreshing to also have a system in place where your level didn’t prevent you from accessing certain weapons or magic. Levelling up is still key as it makes your character stronger but it was never at the forefront of my priorities. Trophy/achievement wise you would normally expect an RPG to be either crazy hard or very time consuming. This is a little bit of both. The trophy for completing the game on the hardest difficulty (Conqueror) seems to ease up as you progress, make use of dodging enemies and using ranged attacks wherever possible. According to those that have got the platinum/100% you’re looking at 30-40 hours, which admittedly isn’t as bad as other RPG games but given the handful of missable trophies and a point of no return care must be taken if you want to do it all in one play through.